YES! Thank you, this is exactly the setup I was looking for. Hi Aaron, I’m glad you found the article useful. Since writing it, I’ve updated my mini-mixer to a slightly more advanced one which has a USB audio input. This accepts the digital audio from my iPad which eliminates the noisy iPad headphone connector and helps with the input levels as it’s essentially line out from the iPad. The high-quality controls, the DAC, the professional connectors and the internal mixing circuitry is also much better which I find results in a much purer and more “predictable” sound. 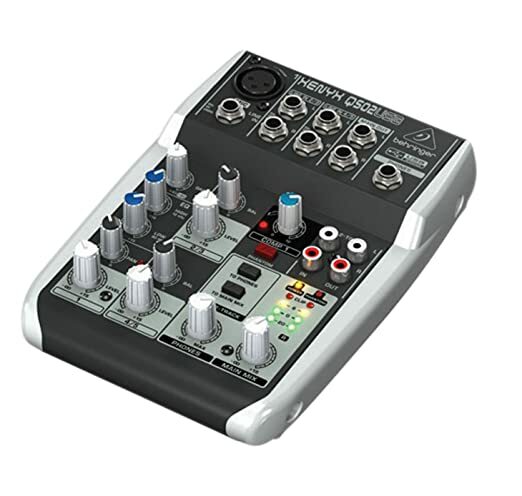 The mixer I’m using is the Behringer Q502USB Xenyx. Your mileage may vary here. Wow, this is involved. Just using the ipad headphone output without the mixer gives the exact same quiet training effect (you hear the piano and the instruction/music). The only downside is that the sound is what the iPad generates out of the Midi signal, so it sounds slightly different, but with much less clutter and fewer cables. Nice solution but I am sticking with the simpler setup (right half of your drawing). Thanks for sharing and explaining everything. I agree, a much simpler setup would be to just plug your keyboard into the lightning port of your iThing and plug in some headphones (assuming you still have a headphone socket). This will work if whatever app you’re using also generates sounds in response to the MIDI signals received from your keyboard – that your are happy to hear – and this is the key point. Listening to app-generated keyboard sounds isn’t what this article is about. This article is specifically about physically mixing the sound generated by your app i.e. backing music or sound effects with the actual sounds from by your digital piano. If you’ve invested good money in an weighted 88 key digital piano which sounds amazing, then you’ll want to hear those sounds rather than the keyboard sounds from your iThing. I personally use both setups. At home with my Yamaha P-115, I use a mixer. When I’m away from home I use a lightweight portable MIDI controller which is powered from my iThing and I listen to the app sounds. Thank you sooo much! Now I can finally get what I need!